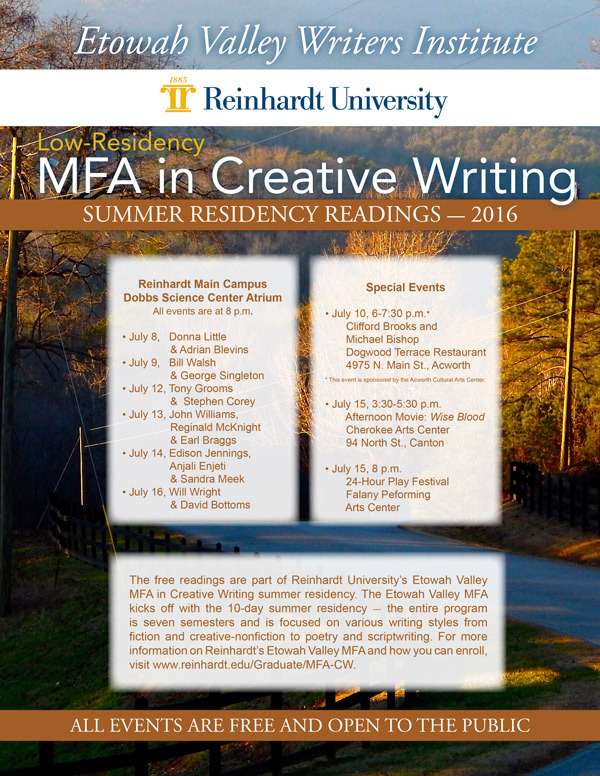 Reinhardt University’s Etowah Valley MFA in Creative Writing summer residency kicks off in July and includes evening readings that are free and open to the public. The 10-day summer residency is part of Reinhardt’s newly SACS-COC approved Etowah Valley MFA in Creative Writing, a seven-semester program focused on various writing styles from fiction and creative-nonfiction to poetry and scriptwriting. While the first portion of the program is underway, the Etowah Valley MFA is opening the reading sessions to the general public. Noted authors include award winning poet Adrian Blevins; Tony Grooms, author of the novel Bombingham; Ann Hite, author of the novel Where the Souls Go; Stephen Corey, poet and editor of the Georgia Review; Will Wright, poet, editor, and 2016 Georgia Author of the Year for Tree Heresies; and Canton native David Bottoms who won the Walt Whitman Prize for poetry in 1979 with the publication of Shooting Rats at the Bibb County Line and served as Georgia’s Poet Laureate from 2000-2012. All readings begin at 8 p.m. and will be held in the Dobbs Science Center Atrium on the campus of Reinhardt University in Waleska. In addition to the on-campus readings, there will be two off-site special events that also are free and open to the public. Clifford Brooks and Michael Bishop will read July 10, from 6-7:30 p.m., at the Dogwood Terrace Restaurant, 4975 N. Main St., Acworth. The event is sponsored by the Acworth Cultural Arts Center. On Friday, July 15, an afternoon movie will be shown from 3:30-5:30 p.m. at the Cherokee Arts Center, 94 North St., Canton. The movie will be Wise Blood ― John Huston’s 1979 adaptation of Flannery O’Connor’s novel, starring Brad Dourif, Dan Shor, Harry Dean Stanton, Ned Beatty, Amy Wright, and William Hickey, and filmed in Macon and the surrounding areas. Also on July 15, the 24-Hour Play Festival will culminate at 8 p.m. at the Falany Performing Arts Center on the campus of Reinhardt University. The festival begins at 7 p.m., July 14, where four writers will meet the directors and actors. They will retire to the computer lab and begin writing 10-minute plays. At 9 a.m., July 15, the directors and actors will be given the scripts and prepare for an 8 p.m. show that night. While MFA students will be the four writers, anyone interested in acting, directing or working back stage should contact Dr. Wayne Glowka at awg@reinhardt.edu. For more information on the Etowah Valley MFA, visit www.reinhardt.edu.